Surprise, Surprise! I was out rambling about this morning with camera in hand. It started out warm and sunny, but by the time I finished a 10AM meeting in the Loop, fog had drifted in, together with cold, which meant today was a perfect day for photographing the city. At about noon, I was within a block of the J. Richard Daley Plaza (the location of the Picasso statue) when I heard the sweet sounds of Chicago blues music reverberating off the surrounding buildings, sounding just like it did when Muddy Waters plugged his guitar into an amp. On stage was veteran blues harpist Matthew Skoller, leading a band with Johnny Iguana on electric piano, Felton Crews on bass, Mark Wilson on drums, and Tom Holland on guitar. Ably assisting Skoller with the vocals was Delta Farr. 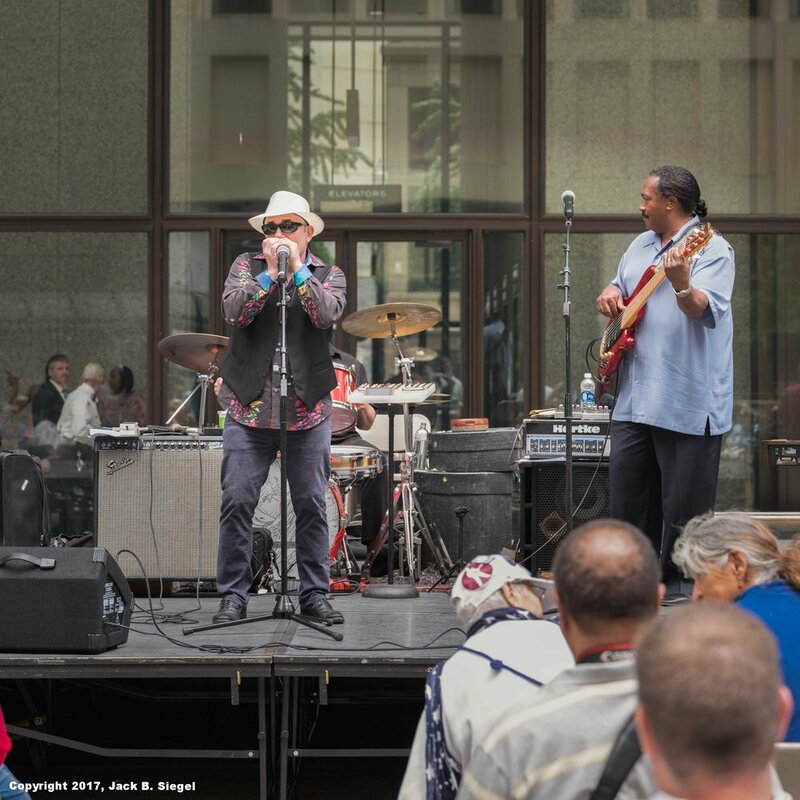 This was the kickoff to the Chicago Blues Festival, which starts Friday and runs through the weekend at Chicago's Millennium Park. If today's performance is any indication of what is to come, no one should miss the main event. A crowd of somewhere between 75 and 100 people sat on chairs, with several couples dancing in the haze. The event was covered by Fox 32 and I believe the Chicago CBS affiliate. A number of photographers were capturing images. It is worth reflecting on the depth of the talent on that stage. Skoller has played all over the world, including Morocco, China, and Chile. He has worked with Harvey Mandel, John Primer, and Big Time Sarah. It is his harmonica work that was used in the original Broadway production of August Wilson's 7 Guitars. Iguana has appeared with Van Morrison, Otis Rush, Sugar Blue, Buddy Guy, and James Cotton, as well as having done a three-year stint with Junior Wells. Felton Crews may not be a household name, but he has worked with some of the greats, including Miles Davis, Minnie Ripperton, Buddy Miles, Billy Boy Arnold, and Charlie Musselwhite. Tom Holland spent many years playing with the legendary James Cotton. I said: A lot of accumulated experience on that stage. The fog worked to my advantage, acting as a gigantic soft box. No harsh shadows or blown out spectral light on faces or arms. I used my Fuji GFX 50S camera, with a 120mm lens, so the photographs are medium format. Overall, the surprise was a gift musically and photogenically from the gods.